Q: How do I manage the myHEALTHware services and apps that I wish to provide my patients? As the organization's administrator, you can choose what myHEALTHware services this organization will offer to its patients. *Notes: The organization name will only be an option for users with permission to act on behalf of the organization. In the My Apps panel, click the Settings tab. 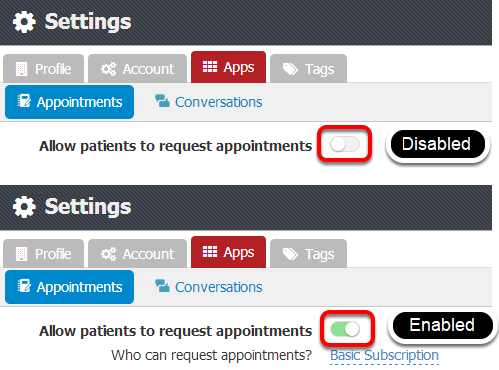 Click the Apps tab to access the features that may be enabled/disabled for patients. Disabled: Patients will not be able to send electronic appointment requests. 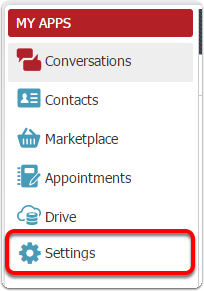 Basic Subscription: Indicates the feature is available to all patients. Premium Subscription: Indicates the feature is only available to patients who are designated as Premium. The clinic's subscription settings can be changed at any time. Please note that if you change a feature from basic to premium, that feature will no longer be offered to patients enrolled in the basic features only. 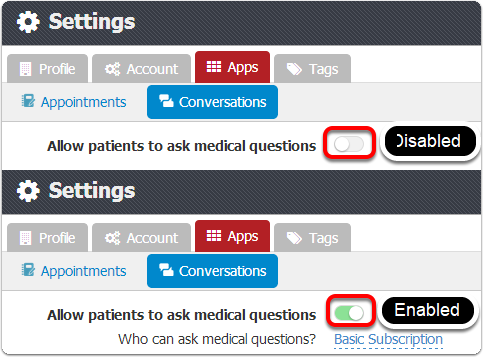 Select Conversations and adjust the switch next to Allow patients to ask medical questions to either disable or enable the feature for your patients. Disabled: Patients will not be able to start conversations with the organization. They can only respond to conversations sent by the organization.